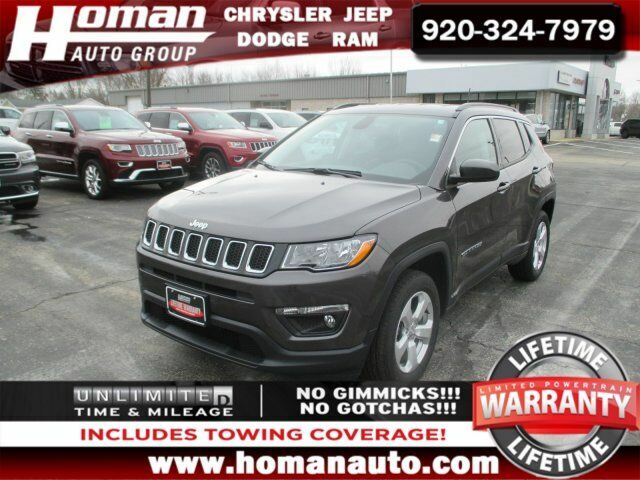 **SUPER LOW MILES**, **4X4**, **BLIND SPOT DETECTION**, **LIFETIME POWERTRAIN WARRANTY See dealer for details** Don't pass up on this fantastic Compass with only 4,300 miles! This 2018 that was part of the Homan Auto Courtesy Transportation Fleet is equipped with a 2.4L 4-Cylinder Engine, 4WD with SelecTerrain System, Premium Vinyl & Cloth Interior, Blind Spot & Cross-Path Detection, Heated Seats & Steering Wheel, Touchscreen Display, Back-up Camera, Bluetooth, Power Driver Seat, Keyless Entry, and Remote Start. All vehicles 2008 and newer under 100,000 miles and not covered by a factory warranty also include our 12 month / 12,000 mile powertrain warranty! DISCLAIMER: All options listed on pre-owned vehicles were effective for original vehicle purchaser and may not apply for subsequent purchasers.